I shot out of bed so fast this morning you would have thought there was a fire or Free People was giving away clothes for free. (If you aren’t familiar with Free People or my obsession with the company- check it here, http://www.freepeople.com) 5:30am. No, I wasn’t getting ready to board a flight back to Thailand and no, I wasn’t heading to Tampa Muay Thai to train, I was going to spin class. 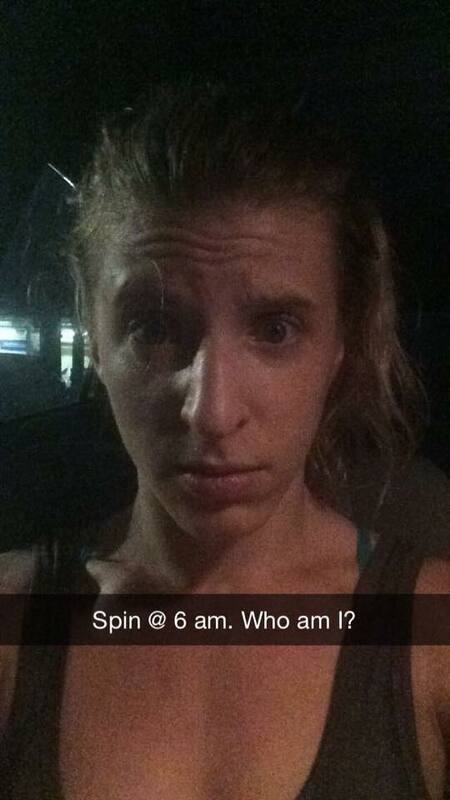 Yes, I was attending spin class at 6 am. Bass bumping, music blasting, EDM raging stationary cycling at 6am. No, this isn’t an interrogation tactic used as an alternative to water boarding, this is an actual class that people attend daily. From what I gathered from literally no sources but my own nightmares, for 1 hour, you bike to nowhere while someone in the front yells encouraging things at you. It’s 6am- I don’t want anyone even talking to me why on earth would I want you yelling over Icona Pop, even if it’s words of encouragement. Now, I’m not stranger to early morning work outs. I’ve done the daily 530am grind, but it’s mostly been on my own- running, hitting the bag, conditioning. Sometimes I’d have one other person working out with me. One. No yelling, no base, no raging what so ever. Maybe, I’ve been looking at this early morning work out all wrong. Because it was GREAT. -that’s a LOT of people. Like a lot. She assured me I would be fine, “They turn off all the lights and put on music videos.” What? Like cosmic bowling? Now I’m totally intrigued. It’s like I’m going to a club at 530am. Are we in Miami? This time I didn’t pass the studio in favor of coffee, although I was tempted. The room was small, packed with bikes, and positive glittery messages written all over the walls. A cheerful instructor struggled with gold and vanilla balloons as we walked in. She greeted my friend (they know each other well), introduced herself, and apologized for being in a rush – she was trying to set up decorations for someone’s anniversary. Well, wow. Celebrations with balloons even at 545am, what a committed, caring group of people. My friend led me to the bikes we were assigned to and helped me find the right height for the seat. The instructor came over eventually to make sure I was all set before we got started- adjusted the height of the bike, showed me the resistance knob (urgh). I looked around the room at the different people rolling in- men, women, “fit”, not so “fit”, young, old. It seemed this class attracted all sorts of people. Everyone found their bikes and started “warming up” … by cycling. I’m like.. why are we all cycling before we start cycling for AN HOUR. But alright, I feel ya- I’ll follow your lead. The instructor comes in and the lights go down and the music goes way up. I mean way up. I listen to music loud. I blast it in my car, but this was on some other level. And thank god it was. It helped. Everything was done to a beat. Now, you may be thinking what do you mean “everything was done,” you’re in a spin class… what else are you doing besides cycling. Actually, quite a lot. There were ups and downs, pulses and sits, high resistance and low- everything had a time and place and most importantly, a beat. It was kind of hard to hear the instructor over the music, but I imagine if I attended class regularly I’d pick up the routine. It was easy to zone out and let the music flood your brain, only paying attention to the changes in sequence we were doing at the time. The class runs an hour give or take a little, but people were shuffling in late or out early most likely due to their work or school schedules. The instructor casually said “good morning” to the late comers or “have a great day” to the early leavers. I, myself, had to duck out a bit early and didn’t feel weird at all about having to cut the class short. Those 50 other people could care less- especially cloaked in darkness. Overall- two thumbs up to the experience. Glad I did it. Training can sometimes get monotonous, it’s important to throw in some variety. Try a yoga class or salsa or SPIN! I feel that it helps to keep your brain active, keeping it in learning mode, ready to soak in new knowledge. And then try to apply it to Muay Thai. Terrible picture, but I had to document the moment somehow. Oh and hey – you might just add something new to your training schedule, which is always fun!